Browser Alerts is a web application that runs within your browser window and which sole purpose is to increase the speed in which you are alerted on stock availability. This is extremely important when it comes to the very hottest items. The best part is you get to choose which items you want tracked and what type of alarms you want to go off. Browser Alerts automatically refresh every 30 seconds to present you the freshest data. Browser Alerts do not replace any other offered alert option but are just another way in which you can be alerted of inventory changes; you still can receive email alerts while running Browser Alerts. 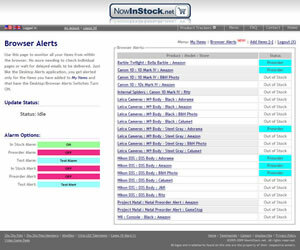 If you already have an account with NowInStock and are receiving alerts, you can skip to step 3. After registering and confirming your NowInStock.net account, Add the Items you want alerted on to your account from within the Your Account. Next you will need to ensure that the Desktop/Browser Alert option for each of your items is "turned ON". This is managed from within the My Items page. Toggle the switches for each item you want to show in Browser Alerts. Navigate to Browser Alerts and you should see the same items you just "turned ON" in My Items. Set your Alarm and Alert Options in the left hand column of the Browser Alerts page. These alarms are what inform you stock is available while you do work or surf the web. Test the alert mechanisms so you get familiar with them! Keep the Browser Alerts window/tab open and go about doing whatever else you want, but remain in an ear-shot of your computer so you can hear the alarm go off if stock becomes available. As long as this window/tab remains open Browser Alerts will function continually. If you close your browser, you can always access the Browser Alerts via the Your Account. So remember, always make sure you have Browser Alerts open in order for it to work. When the alarm or visible alert goes off, act fast!